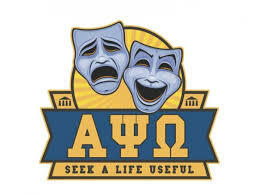 Alpha Psi Omega is a National Honor Theatre Society. Colleges and universities of recognized standing, having an established theatre program or theatre club for the purpose of producing plays, are eligible for membership. To become a member one has to be a part of at least two shows and earn a total of 75 points through various jobs or responsibilities in the theatre. Join Alpha Psi Omega on Facebook. Join the Armstrong Campus Alpha Psi Omega on Facebook.